Catherine Mayeur-Jaouen, Rachida Chih and Rüdiger Seesemann (éd. ), Sufism, literary production, and printing in the nineteenth century, (Mitteilungen zur sozial- und Kulturgeschichte, 37), Ergon Verlag, Würzburg, 579 pages, 2015. 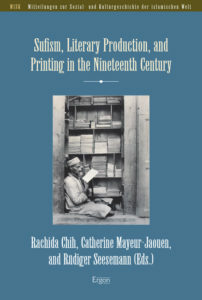 Catherine Mayeur-Jaouen, « Sufism and printing in nineteenth-century Egypt », Ibidem, p. 25s. Alberto F. Ambrosio, « The library of the whirling dervish: an editorial policy », Ibidem, p. 75s. Josef Dreher, « A collection of theological and mystical texts describing the Prophet Muḥammad: the Jawāhir al-biḥār by Yūsuf b. Ismāʿīl al-Nabhānī », Ibidem, p. 255s. This entry was posted in Publications and tagged Ambrosio, Dreher, Mayeur-Jaouen by admin. Bookmark the permalink.